The publication of The Transition Handbook in 2008 facilitated the explosion of transition initiatives all around the World. Indeed, TT Guildford was born out of Rod and I reading the handbook. 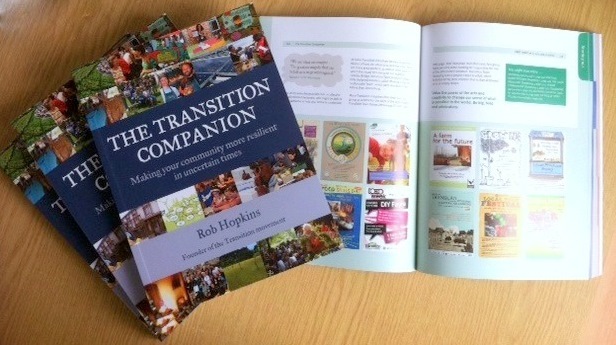 Now Rob Hopkins has published a new book “The Transition Companion: making your community more resilient in uncertain times”. The book is split into three parts. The first is a shortened and updated version from the previous book outlining the challenges we are facing (Peak Oil and Climate Change). The second part is a quick look at what the Transition response can look like, told through four Transition town examples. While the handbook was more prescriptive, outlining the series of steps involved in setting up the first succesful transition towns, for others to follow. This book, as the title says, is a Companion. It recognises that transition initiatives will develop differently in every place, so instead aims to provide ‘tools’ and ‘ingredients’ to facilitate this. Therefore, the final part, which constitutes the majority of the book, is a list of ‘ingredients’ and ‘tools’ for success. There are entries on topics from Awareness raising to running meetings, to visioning, and council policies. What’s great is that these are succinct, 2-3 pages, and grouped into broad themes. There’s also lots of links and suggestions between topics, so it’s easy to jump in and out. If we wait for the governments, it’ll be too little, too late. I think this captures the part of the essence of Transition perfectly; that it is grounded in the challenging reality we face, but also hopeful and optimistic for what we can d0! The first book was fantastic, and the second looks even better, so I highly recommend a look. A copy should be in the Guildford library soon…..
Great idea to ensure the local library gets a copy soon. However, in the spirit of community and this group, why not get a few copies between us to share around? I’m keen to get a copy and would certainly be happy to share it around. I’d like a book too, please. The screening of Fresh was my first introduction to the transitioners, and I’m hopeful of being able to make a difference through this group.